• the objectives of occupational safety and health and the environment will be reviewed and reassessed regularly. • the effectiveness of the governance of occupational safety and health and environment management system will be monitored. The effectiveness of the management system of occupational safety, health and environment is the responsibility of NIOSH staff in ensuring a safe, healthy and environmentally friendly work environment. Candidates who are interested can write in (resume & surat iringan) Human Resource Division (HRD) or email to hrd@niosh.com.my before 28th February 2017 (Tuesday). 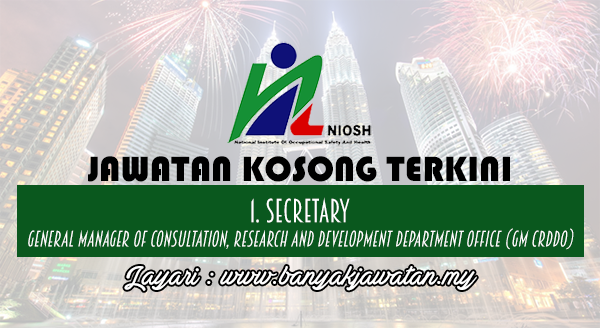 0 Response to "Jawatan Kosong di National Institute of Occupational Safety & Health (NIOSH) - 28 February 2017"